Fort Lauderdale, FL – The nation’s average price of gas fell an even three cents per gallon over the past seven days, according to the weekly fuel price survey from the U.S. Energy Information Administration. In the past three weeks, the nation’s gas prices have fallen, on average, about 11¢ per gallon. This week’s E.I.A. report shows the cost of regular unleaded has fallen to $2.29 per gallon. Regionally, prices were down across the board, with strong declines in the Lower Atlantic states, where prices fell over a nickel per gallon. Prices were down only slightly in the Midwest, coming off a near seven-cent price drop just last week. Truckers got some good news, as diesel prices also declined on the week. Prices fell just over two cents per gallon to settle at $2.47. As with regular gas, prices for diesel fell in all regions. Regional cost averages for both gasoline and diesel are listed below, ranked from highest to lowest price. 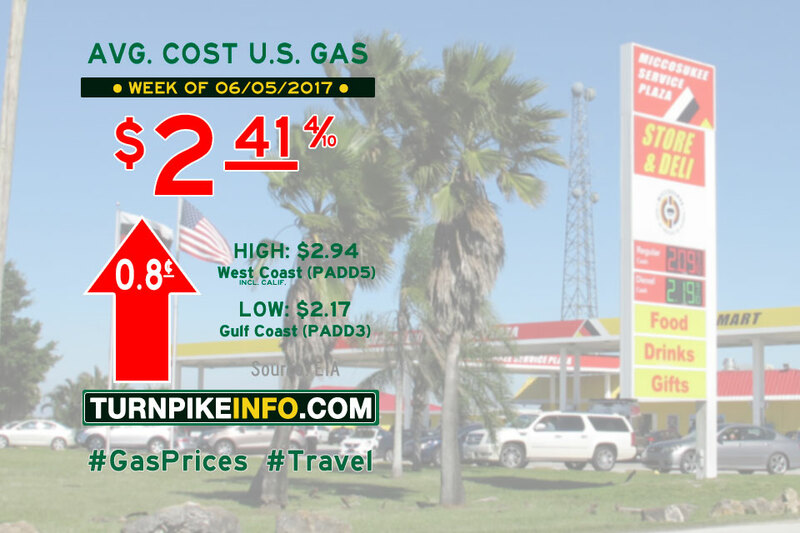 Fort Lauderdale, FL – The nation’s average price of gas fell another nickel per gallon during the past seven days, according to the weekly fuel price survey from the U.S. Energy Information Administration. The E.I.A. report shows the cost of regular unleaded has fallen to $2.32 per gallon. That figure is nearly ten cents less, on average, that just two weeks ago, as retail prices relent amid a glut of oil worldwide. Regionally, prices were down across the board, with declines led by the Midwest, where prices fell nearly seven cents per gallon. Prices were down the least in the Rocky Mountain states, as prices in that region were off by just under a penny per gallon. Truckers got some good news, as diesel prices also declined on the week. Prices fell well above three cents per gallon to settle at $2.49. Like gasoline, prices for diesel fell in all regions. Regional cost averages for both gasoline and diesel are listed below, ranked from highest to lowest price. Fort Lauderdale, FL – The average price of a gallon of regular unleaded took a plunge on the week, according to the latest weekly survey from the U.S. Energy Information Administration. For the first time in weeks, the nation’s average gas price fell nearly a nickel per gallon to $2.37. Prices in all regions declined, with the lowest drop found across the Rocky Mountain states, where prices only fell about a penny per gallon. The Midwest enjoyed the biggest break, with prices falling an average 7.4¢ per gallon, according to the E.I.A. The E.I.A. report had as much good news for truckers this week, as average price of a gallon of diesel fuel fell to $2.52 per gallon, down an even four cents from last week. Regional cost averages for both gasoline and diesel are listed below, ranked from highest to lowest price. This story has been corrected to update the weekly price average for diesel fuel in the West Coast region. The previous report showed diesel prices on the West Coast averaged $2.681 per gallon. This figure has been corrected to $2.805 per gallon. A new interchange is slated to open June 10 on the northern leg of Florida’s Turnpike near mile 278, officials with Florida’s Department of Transportation have announced. 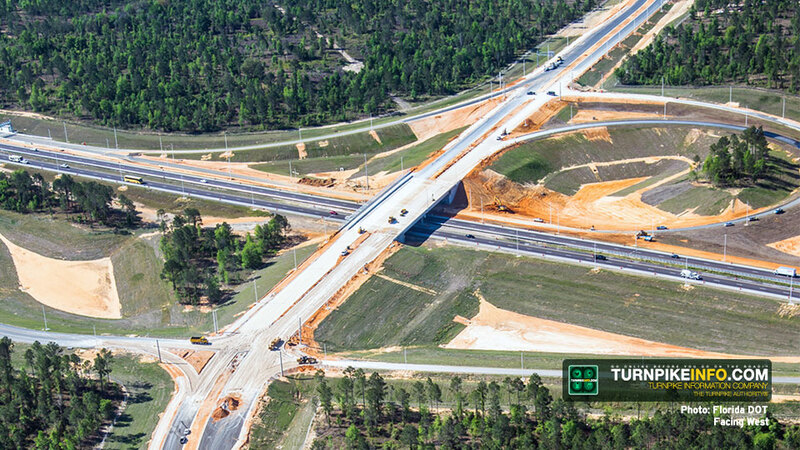 The new “Minneola Interchange” is already a common site for regular drivers of the turnpike, as lane closures and adjustments have been made over the past year to accommodate construction of the new ramps. The exit number will be 278. An aerial view of the Minneola Interchange on Florida’s Turnpike, taken in March 2017, looking west over the turnpike along Hancock Road. Photo: Florida DOT. The interchange will be an all-electronic one, which is to say no cash will be accepted at the tolls, which will be collected only on the southbound entrance and northbound exit ramps. Florida’s Turnpike is in the process of converting to an all-electronic system, but completion is still several years away. The junction will give nearly direct access to the town of Minneola, which sits just west of the turnpike, and north of Clermont, a western suburb of Orlando. Drivers exiting the turnpike will find themselves on Hancock Road in Minneola, with access to Hancock Road, which is being completed to connect towns on the north and east of the turnpike, on the west shore of Lake Apopka, to those on the south and west, including Minneola and Clermont. The opening of the interchange will be heralded locally with a community celebration by the city of Minneola, as well as a 5K run to honor Christa Deason, and FDOT employee city officials say was instrumental in bringing the interchange project to fruition. Following the run, the ribbon-cutton for the new interchange is expected to happen around 9:30 a.m., at which time the ramps will be opened for traffic. 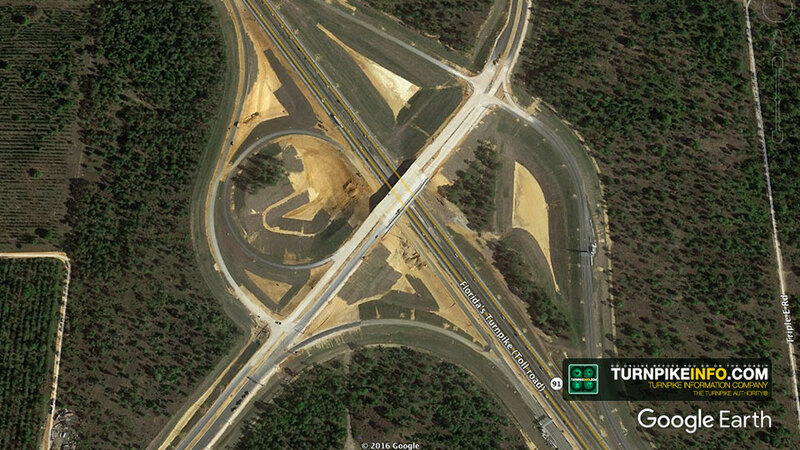 A satellite view of the new Minneola Interchange, from Google Earth, taken on March 17, 2017, shows the entrance and exit ramps nearly complete, with the electronic toll gantries already installed on the northbound exit ramp and southbound entrance ramp. Photo: Google Earth. The cost of the project was funded in part by private developers, including Family Dynamics Land Company, LLC, which donated all the land for the project, and Minneola Mountain Properties Community Redevelopment Area, which raised funds for the construction of the interchange, itself, according to the FDOT. The completion of Hancock Road, which was an integral part of the interchange project, was funded by both Family Dynamics and by the government of Lake County, where the interchange is located. Fort Lauderdale, FL – The nation’s average price of gas went up nearly a penny per gallon during the past week, according to the U.S. Energy Information Administration. The E.I.A. weekly fuel price survey shows the cost of a gallon of regular unleaded increased by about eight-tenths of a penny. 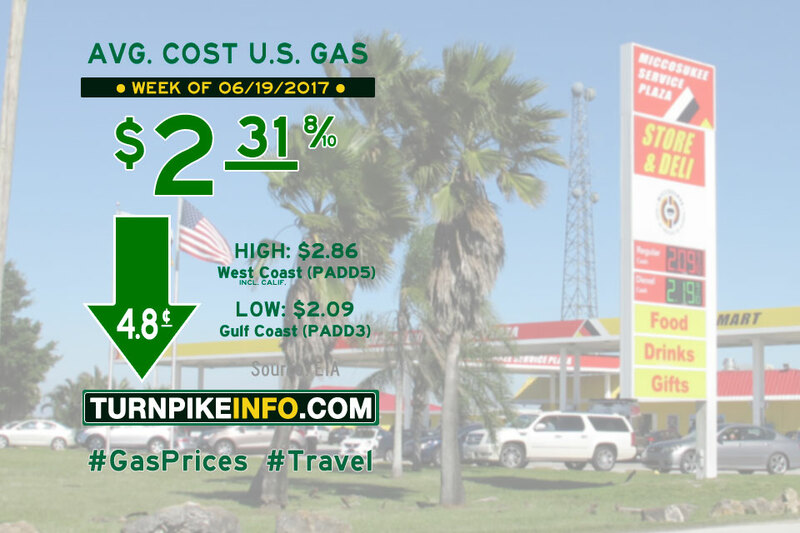 However, due to rounding, the average gas price remained unchanged at $2.41 per gallon, despite the increase. Regional price averages were mixed nationwide, according to the weekly survey. The West Coast region, the where prices are the highest, enjoyed a slight decline in prices. The Gulf Coast, where prices are the cheapest, saw prices at the pump go up slightly. The E.I.A. report had better news for truckers this week, as prices went down in nearly all regions or, at the worst, barely moved upward. Nationwide, the average price of a gallon of diesel fuel is $2.56, down from $2.57 last week. Regional cost averages for both gasoline and diesel are listed below, ranked from highest to lowest price.